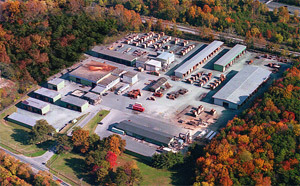 Ipe Wood Drying: Kiln Dry or Air Dry? To Air Dry or To Kiln Dry, That Is the Question. If you ask anyone who knows their stuff when it comes to high-quality decking, they’ll tell you that Ipe is the species for any high-end job. Similarly, if you ask a group of lumber experts what Ipe’s primary application is, decking will be the hands-down response. This premium lumber species is eased on all four edges (E4E) and surfaced on all four sides (S4S), eliminating both sharp edges and the potential for splintering. This extremely hard wood has a fire-rating to match that of iron, giving it the nickname “ironwood.” Even with all that’s in favor of Ipe as a decking wood, the issue of drying bears consideration. 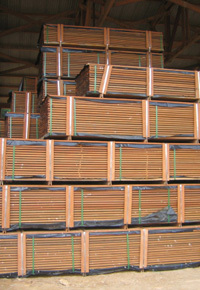 Typically, South American decking species are air dried to a moisture content of approximately 18% before being milled. For exterior products that will be subjected to a variety of weather conditions, the high moisture content promotes stability. Even with sun-baked summers, high amounts of precipitation, and drastic seasonal temperature changes, high moisture content can allow an Ipe deck to weather more than 40 years’ worth of storms. Depending on how our clients choose to install the Ipe decking, we may have to rout a groove for clip fasteners; however, that is typically all that we are doing to the wood before shipment. While we do stock a small amount of rough-sawn, kiln-dried Ipe, we don’t often receive orders for these interior-grade products. 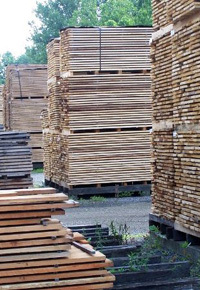 They’re dried to a 6-8% moisture content and can then be milled at our millworks. This completely different Ipe product is as appropriate for decking as the decking variety is for interior use: not at all. However, there is a third variety that we carry: a hybrid of both extremes. Kiln-dried Ipe decking is ideal for exterior applications in dry climates. Its moisture content varies from 10 to 18%, putting it precisely between the moisture content levels of typical air-dried Ipe decking and the interior-grade Ipe. In desert climates or high-altitude environments, this hybrid choice is ideal. Another consideration is the amount of direct sunlight that beats on the deck throughout the day; a high amount of sun exposure can dry out the wood, causing it to warp. By laying down drier boards, such as kiln dried Ipe decking, you reduce the chances of dealing with such a frustrating scenario. While air-dried Ipe is the best solution for most of the country, kiln-dried decking may be optimal in unusually dry climates or unshaded areas of the South. While over time, decking comes to an equilibrium with its environment and changes with the seasons, the first year after installation can be crucial, and you want to install the right type of Ipe for your particular environment to achieve best results. 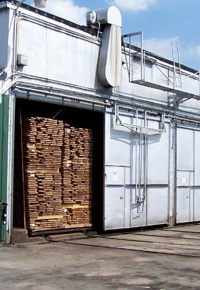 At J. Gibson McIlvain lumber company, we carry an expansive selection of both kiln-dried and air-dried Ipe, ready to ship to your project location throughout the United States. 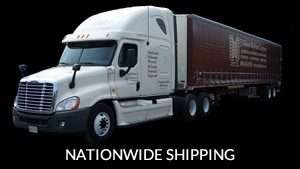 Call us today at (800) 638-9100 to see if we can serve you.